1, 2, 3... make a wish! A birthday only comes around every 365 days. Here’s a collection of the best birthday wishes for 2019 that you can use as inspiration in crafting your message. You can use these idea-starters when sending a heartfelt birthday message to a friend, brother, sister, mother, father, or anyone you care. Sometimes it’s a real challenge to come up with what to write in a birthday message. To others, it’s art while for some it doesn’t come naturally. The worst you can do is not to write anything at all. It doesn’t matter if you are quoting or copying an idea. The right wish will make all the difference. As the saying goes, it’s the thought that counts. Feel free to copy and paste the message or click the image to download a high-quality version for posting to social media like Facebook, Twitter, or Pinterest. Count your life by smiles, not tears. Count your age by friends, not years. Happy birthday! Sending you a birthday wish wrapped with all my love. Have a very happy birthday! Hope your special day brings you all that your heart desires! Here’s wishing you a day full of pleasant surprises! Happy birthday! It’s always a treat to wish happy birthday to someone so sweet. When the little kids ask how old you are at your party, you should go ahead and tell them. While they’re distracted trying to count that high, you can steal a bite of their cake! Happy birthday! Happy birthday to someone who is smart, gorgeous, funny and reminds me a lot of myself... from one fabulous chick to another! Happy birthday! I hope all your birthday wishes and dreams come true. Sending your way a bouquet of happiness... To wish you a very happy birthday! Congratulations on being even more experienced. I’m not sure what you learned this year, but every experience transforms us into the people we are today. Happy birthday! Birthdays are a new start, a fresh beginning and a time to pursue new endeavors with new goals. Move forward with confidence and courage. You are a very special person. May today and all of your days be amazing! Happy birthday. Happy birthday! May your Facebook newsfeed be filled with messages from people you never talk to. On this special day, I raise a toast to you and your life. Happy birthday. Many years ago on this day, God decided to send an angel to earth. The angel was meant to touch lives and that happened! Happy birthday my sweet angel! On your birthday we wish for you that whatever you want most in life it comes to you just the way you imagined it or better. Happy birthday! Cheers on your birthday. One step closer to adult underpants. Forget about the past, you can’t change it. Forget about the future, you can’t predict it. Forget about the present, I didn’t get you one. Happy birthday! This birthday, I wish you abundant happiness and love. May all your dreams turn into reality and may lady luck visit your home today. Happy birthday to one of the sweetest people I’ve ever known. As you get older three things happen. The first is your memory goes, and I can’t remember the other two. Happy birthday! Happy birthday! May your Twiiter timeline be filled with messages from people you never talk to. A friend like you is more priceless than the most beautiful diamond. You are not only strong and wise, but kind and thoughtful as well. Your birthday is the perfect opportunity to show you how much I care and how grateful I am to have you in my life. Happy birthday! It’s birthday time again, and wow! You’re a whole year older now! So clown around and have some fun to make this birthday your best one. Happy birthday! May the joy that you have spread in the past come back to you on this day. Wishing you a very happy birthday! Wishing you a beautiful day with good health and happiness forever. Happy birthday! You are only young once, but you can be immature for a lifetime. Happy birthday! Just wanted to be the first one to wish you happy birthday so I can feel superior to your other well-wishers. So, happy birthday! Happy birthday to you. From good friends and true, from old friends and new, may good luck go with you and happiness too! Happy birthday to one of my best friends. Here’s to another year of laughing at our own jokes and keeping each other sane! Love you and happy birthday! Words alone are not enough to express how happy I am you are celebrating another year of your life! My wish for you on your birthday is that you are, and will always be, happy and healthy. Don’t ever change! Happy birthday. A wish for you on your birthday, whatever you ask may you receive, whatever you seek may you find, whatever you wish may it be fulfilled on your birthday and always. Happy birthday! Happy birthday to someone who is forever young! May you be gifted with life’s biggest joys and never-ending bliss. After all, you yourself are a gift to earth, so you deserve the best. Happy birthday. Forget the past; look forward to the future, for the best things are yet to come. Happy birthday. I hope that today, at your party, you dance and others sing as you celebrate with joy your best birthday. I may not be by your side celebrating your special day with you, but I want you to know that I’m thinking of you and wishing you a wonderful birthday. Be happy! Today is the day you were brought into this world to be a blessing and inspiration to the people around you! You are a wonderful person! May you be given more birthdays to fulfill all of your dreams! Happy birthday. Your life is just about to pick up speed and blast off into the stratosphere. Wear a seat belt and be sure to enjoy the journey. Happy birthday! Another adventure filled year awaits you. Welcome it by celebrating your birthday with pomp and splendor. Wishing you a very happy and fun-filled birthday! Your birthday is the first day of another 365-day journey. Be the shining thread in the beautiful tapestry of the world to make this year the best ever. Enjoy the ride. Happy birthday. You’re older today than yesterday but younger than tomorrow, happy birthday! You look younger than ever! Happy birthday! Don’t get all weird about getting older! Our age is merely the number of years the world has been enjoying us! I wish for all of your wishes to come true. Happy birthday! I can’t believe how lucky I am to have found a friend like you. You make every day of my life so special. It’s my goal to make sure your birthday is one of the most special days ever. I can’t wait to celebrate with you! It’s a smile from me... To wish you a day that brings the same kind of happiness and joy that you bring to me. Happy birthday! Count not the candles... see the lights they give. Count not the years, but the life you live. Wishing you a wonderful time ahead. Happy birthday. A simple celebration, a gathering of friends; here wishing you great happiness and a joy that never ends. Happy birthday. On this wonderful day, I wish you the best that life has to offer! Happy birthday! Sending you smiles for every moment of your special day... Have a wonderful time and a very happy birthday! On your birthday, I thought of giving you the cutest gift in the world. But then I realized that is not possible, because you yourself are the cutest gift in the world. 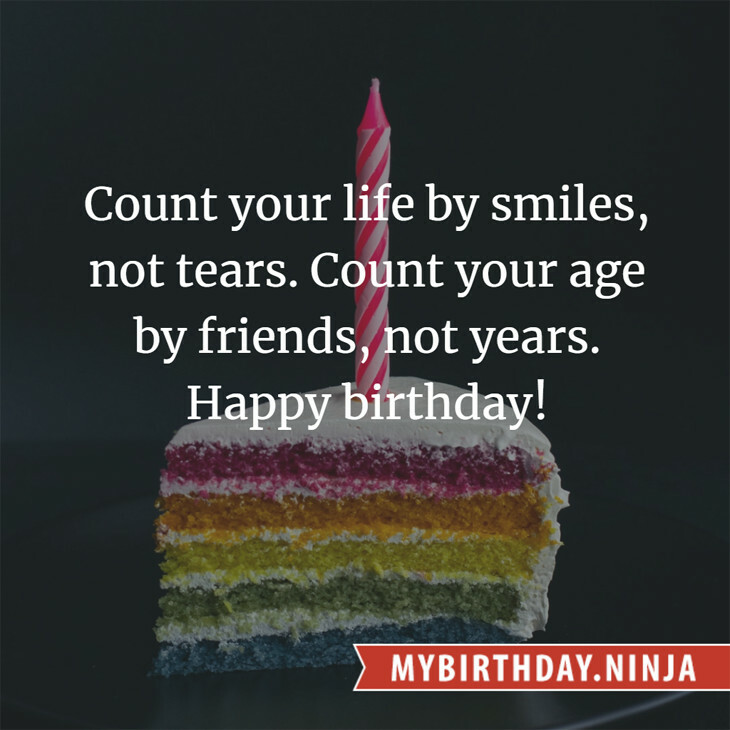 This ninja genuinely hopes you have enjoyed these birthday wishes, blessings, funny quotes, and greetings for friends or family members. Don’t forget to share the birthday fun facts from this website. Cheers!